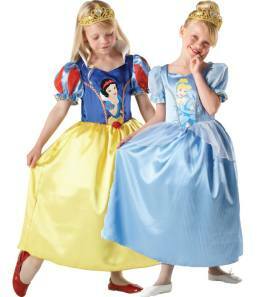 Little girls love playing dress up and what better costume can you get than this Reversible Disney Princesses Fancy Dress Costume, which will let her choose between the ballgown of Cinderella and the classic Disney Snow White dress. The outfit includes a reversible dress with Snow White's red, blue and yellow satin-look gown on one side and Cinderella's blue and silver ballgown on the reverse. Both options are printed with a picture of the relevant Disney princess on the front. Also included is a gold crown adorned with faux gems.